The old linear economy is mostly depending on fossil energy. However, these are not inexhaustible sources. Worldwide we see the tendency that gas and oil fields are becoming depleted, resulting in closure of a hundreds of oil rigs. For example; more than 600 platforms will be dismantled between 2016 and 2021, mainly in the Gulf of Mexico and the North Sea. The sinking of oil rigs is forbidden due to ecological objections and (complete) decommissioning is very expensive. In the long run this can become problematic for several regions, like the Gulf region, where drilling platforms fall into disuse. In our proposal we make a virtue of necessity. After all, there are great opportunities for the Dutch maritime sector in the dismantling of drilling platforms. In combination with water technology and the generation of sustainable energy, sustainable production areas can be created. We show how various components in a new relationship with each other can ensure new ecosystems, healthy growth, sustainability and quality of life. 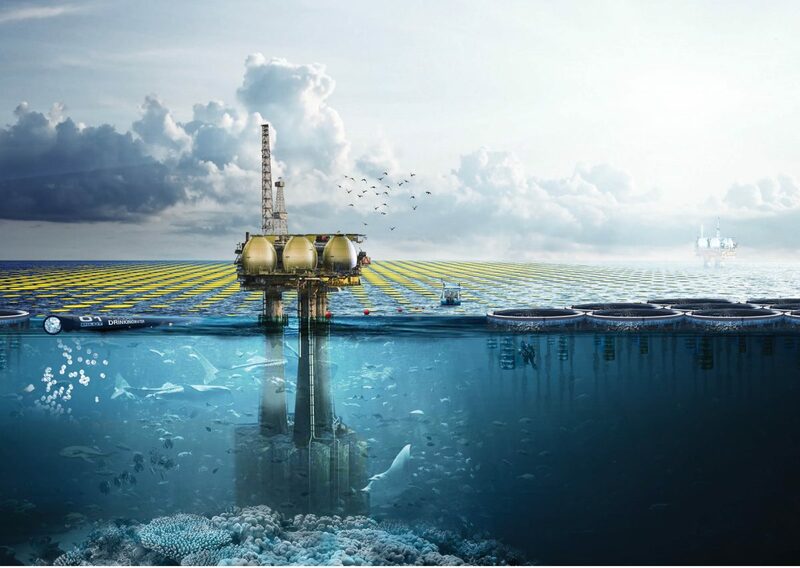 We find a step towards a better solution in ‘Return to Nature’: we leave the foundation of an oil rig to reuse for maritime life and transform it into a revolutionary, sustainable production facility for energy, water and food. The dismantling of oil rigs leaves tons of steel being unused. 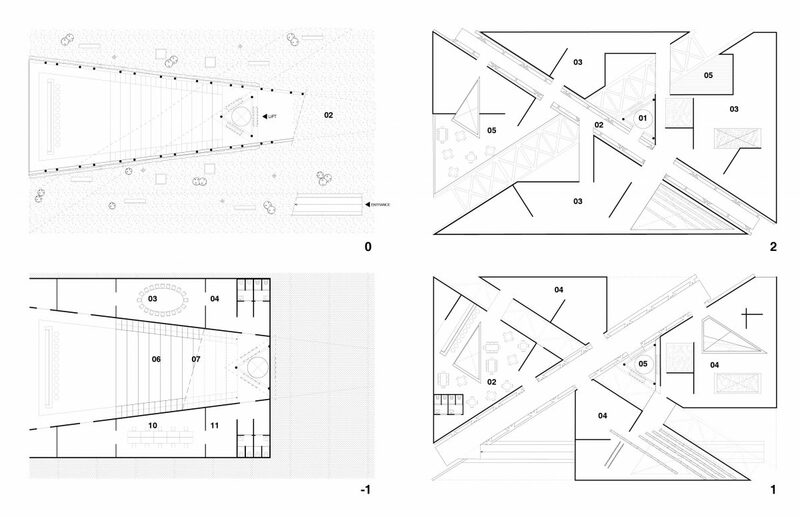 We proposed to reuse parts of a platform as a test case to design the Dutch pavilion for de World Expo 2020. In this way we show the opportunities to deploy decommissioning on a global scale for sustainability purposes and create a business model, so that decommissioning becomes affordable and new economies can be delivered and exposed in a live changing user’s experience. Remove the existing top of these platforms and dismantle the oil-producing infrastructure. 1. Energy by making solar fields at sea. 2. Fresh water with desalination plant using the generated energy. 3. Produce food and bio-based products. We show that with the generated solar energy and the desalinated water crops can also be grown on land. Parts of the former oil rig are shipped and will be reused as building material. 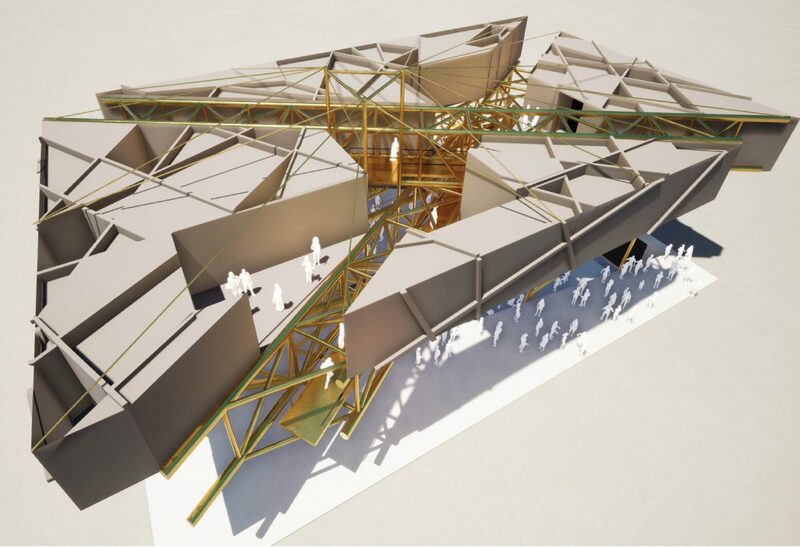 We reuse parts of the old oil rig and we create the Platform for a renewable future; an exhibition space with an auditorium/event space in the derrick. The derrick serves as construction for the upper floors connected with an ‘architectural route’ made out of cranes and trusses. The goal through the entire experience is to change the view of the visitor on the coherence of energy, water and food from the perspective of circularity. Not only through the transformation of the platform, from derrick to pavilion, but also through the way in which the visitor is tempted to place himself in the role of “transformer”.